Monorail is a very popular transport and tourist attraction in Sydney. Sydney Monorail operates every day of the year except Christmas Day. The Monorail runs every 3 to 5 minutes linking the City with Darling Harbour providing easy access to many of Sydney's tourist attractions. This image belongs to the travel and nature stock photo library. This stock photo of Monorail at Darling Harbour is available for licensing for commercial and editorial uses including websites, blogs, books, magazines, brochures and advertising. Restrictions may apply for images which contain third party copyrighted material or sensitive subjects. Photos of artwork are for editorial use only. 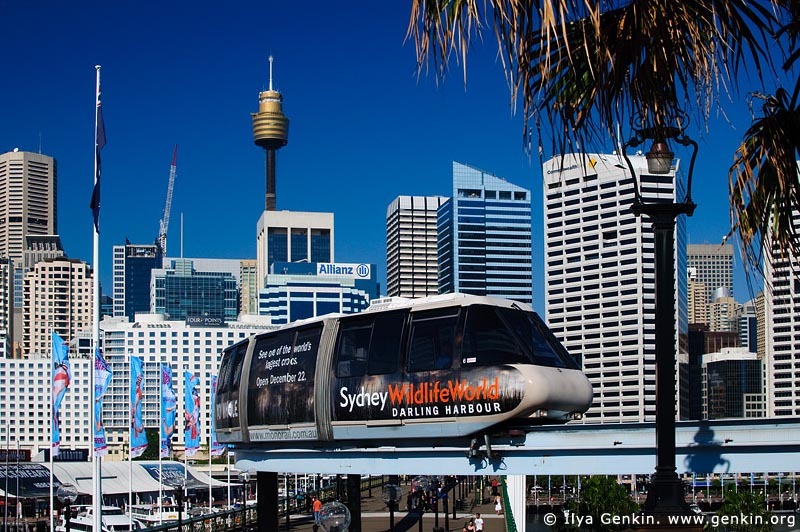 This image id AU-SYDNEY-DARLING-HARBOUR-0003 of Monorail at Darling Harbour, is copyrighted © by Ilya Genkin. This is not a public domain image.